Just in from Marga. New art and a note. The Easter bunny has a long history, first appearing at least fifteen hundred years ago as the earthly representative of the Saxon fertility goddess “Eastre”. 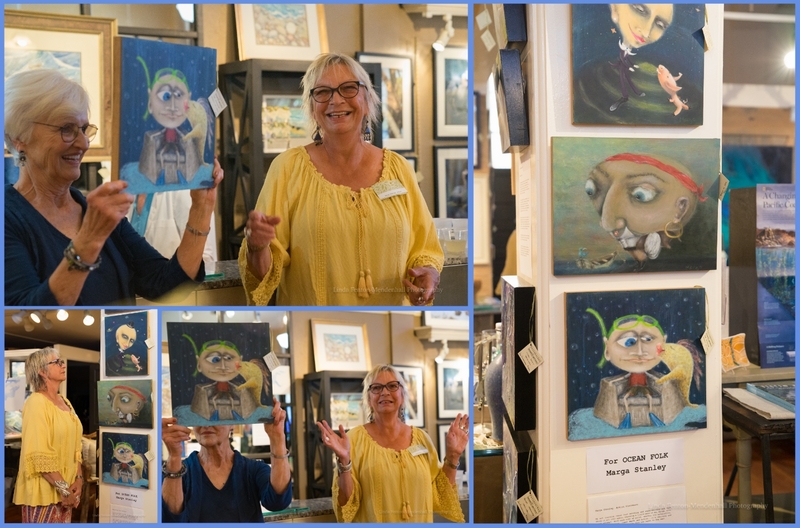 Featured artists for ‘March’ exhibition displayed on the west showcase wall: whimsical paintings by Marga Stanley, pastels by Leah Kohlenberg, fused glass necklaces by Mike Fox, fresco paintings by Agnes Field. Accessories made by hand: willow bird nests, felt bunny, hand turned wood candlestick and hand forged bronze candelabra. Featured artists for ‘March’ exhibition displayed on the west showcase wall. 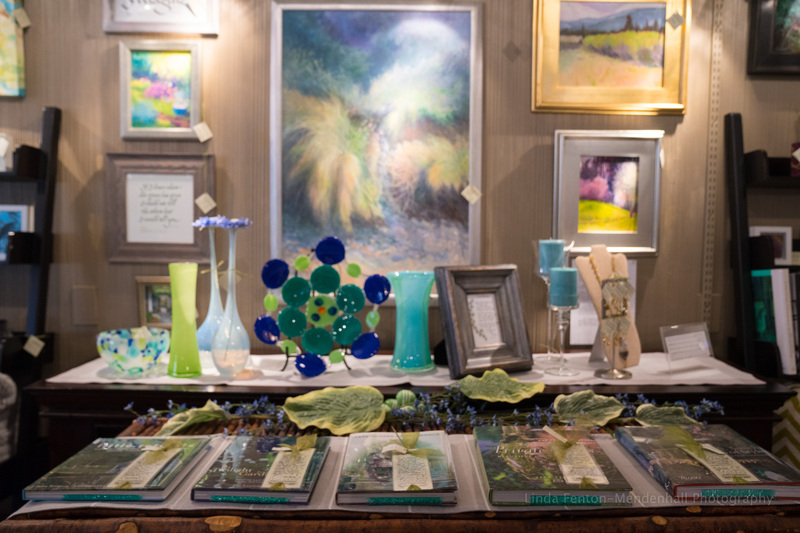 Left to right: Abstract “March Grasses” original by Leah Kohlenberg, painting in rain by Jeni Lee, impasto oil by Melissa Jander, fused glass by Mike Fox, hand-made glass by Bob Heath and pastel pen and ink by Lori Wallace-Lloyd. Featured ‘March’ exhibition artists. Left to right: Penelope Culbertson calligraphy, en plein air original by Bev Drew Kindley, miniature oil by Barbara Rosbe Felisky, acrylic “Dune Grasses” by Bev Drew Kindley, oil landscapes by Lisa Wiser, couture jewelry by Mary Hurst, hand-made glass platter by Sandy and Bob Lercari, pastel by Gretha Lindwood and fine art hardbound books selected for the spring season. Displays by D. Fairweather, gallerist/ allied member A.S.I.D., American Society of Interior Designers. Photos by Linda Fenton-Mendenhall/ Seaside First Saturday Art Walk photographer. 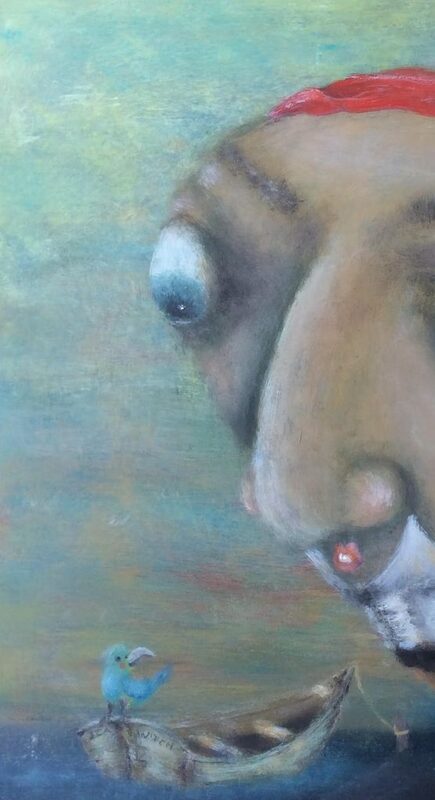 ‘March’ on exhibit through March 31. 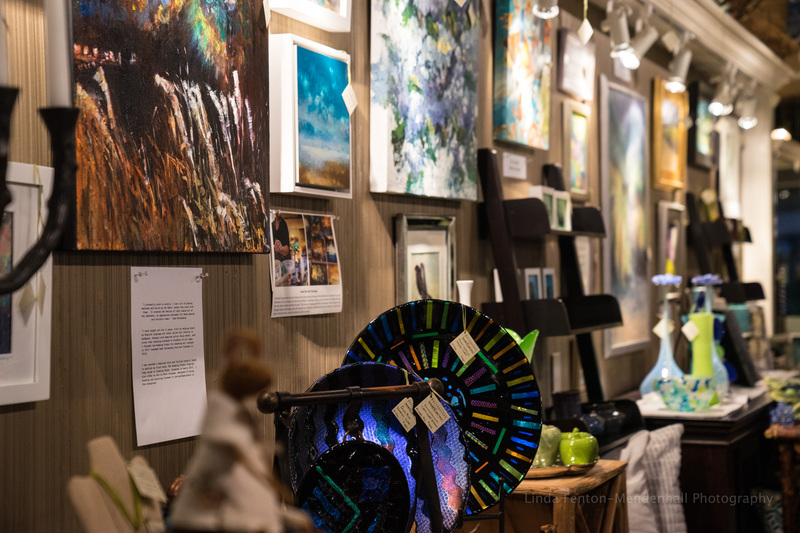 From traditional to transitional, representational to contemporary, realism to impressions, The Fairweather House and Gallery has presented an eclectic collection of fine art by an exceptional group of living Northwest regional artists for over 12 years. Save the date and time. 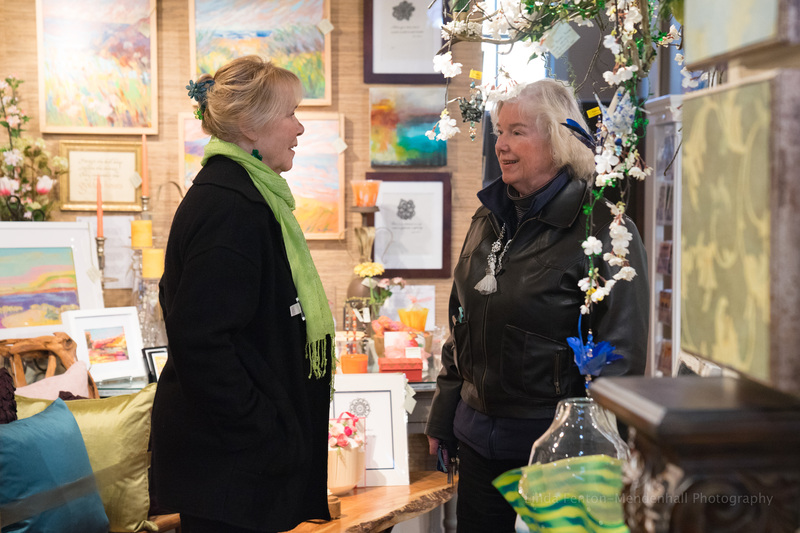 Celebrating 15 years in 2019, the next Seaside First Saturday Art Walk, will be held 5 to 7 p.m., Saturday April 6. The free event takes place between Holladay Drive and Broadway Street in the Historic Gilbert District of downtown Seaside. 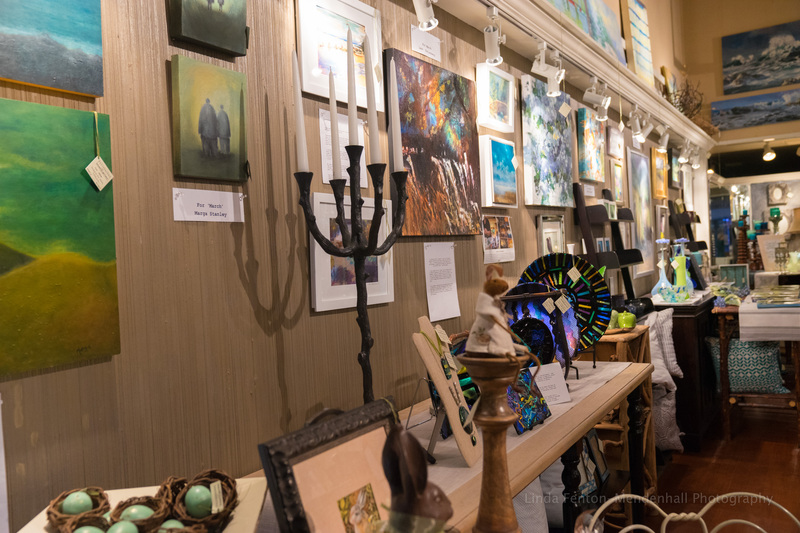 Opening artist reception for “Life Abundant” featuring regional artists Bill Baily, Diane Copenhaver, Barbara Bacon Folawn, Martha Lee, Emily Miller, Veronica Russell, Jan Shield, introducing oil painter James Waterhouse andwatercolor artist Carolynn Wagler. “For April the works are full of energy to create a feeling of the air merging with the trees and fields where from the earth they grow. 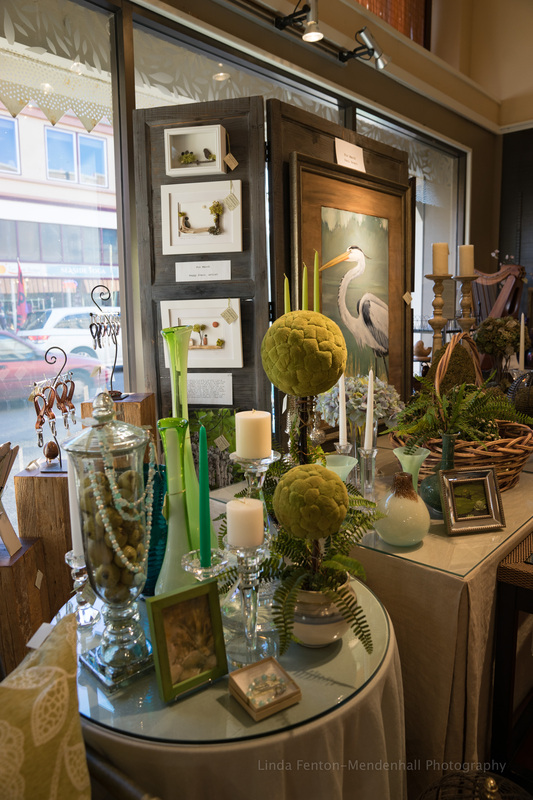 They express a sort of witness to the soil becoming the grass and how plant life abounds joined in a harmony of space and form,” Jan Shield, Professor Emeritus of Art at Pacific University. 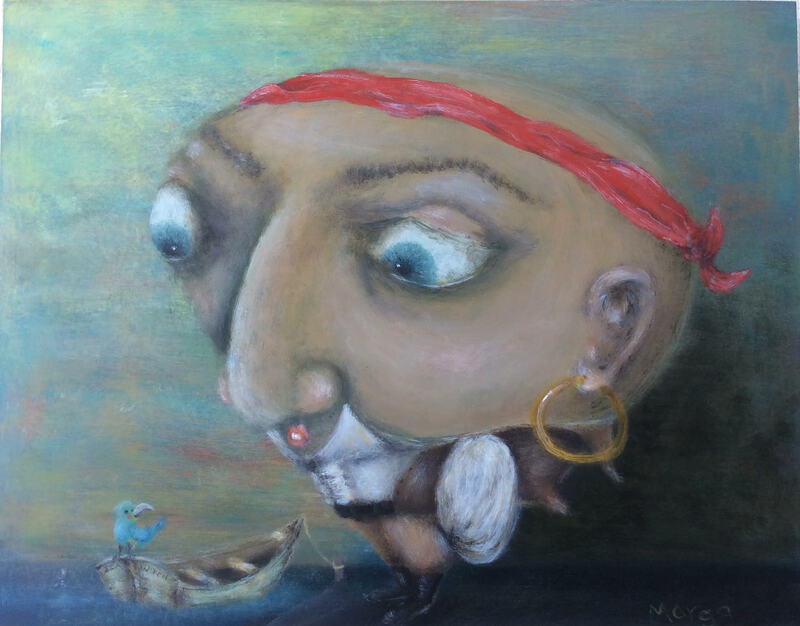 Painting demonstration, artist lectures, LIVE music by Shirley 88 and local habitat lecture by Neal Mail at 6:pm. Indeed, ’tis time for a wee bit of Irish. Fairweather’s. March 2019. 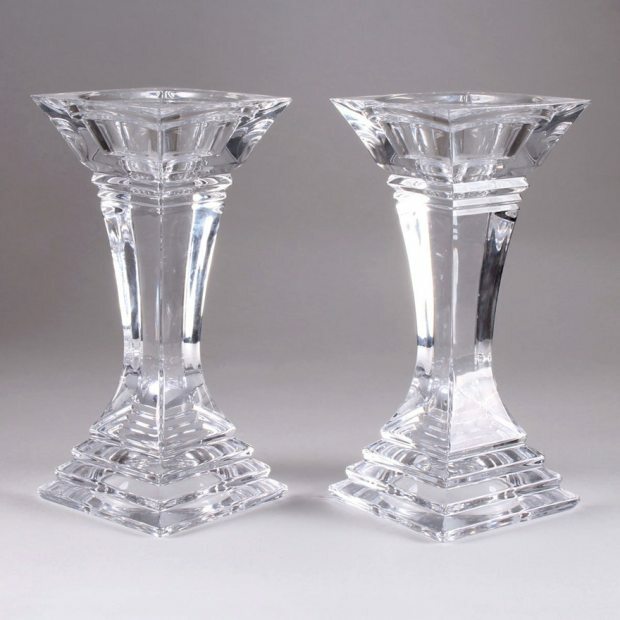 Ireland is home to some of the world’s most impressive crystal designs, among them ‘Shannon’ crystal. The craft of Irish crystal making is an art form that has been developed and modified over hundreds of years, going back as far as the Celts, who brought the first glass to Ireland in for jewelry making. 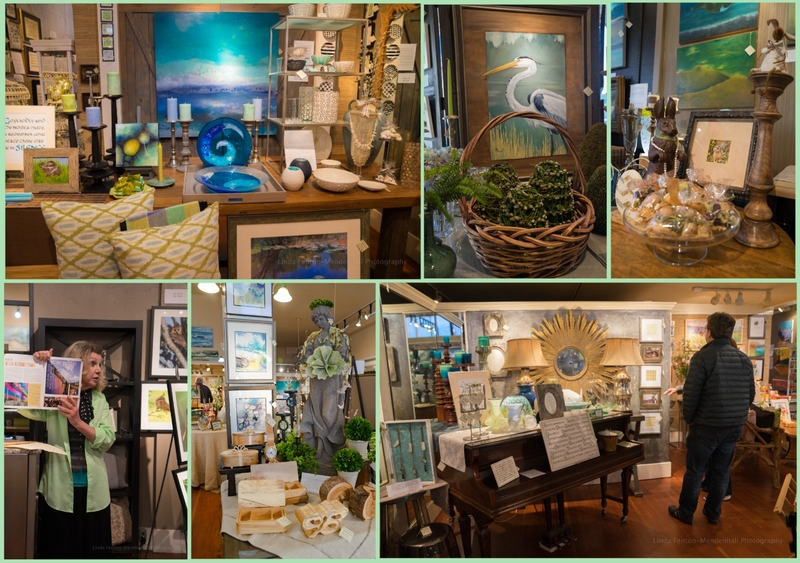 Table design featuring ‘Shannon’ crystal, mixed-media beach stone and lichen art by Peggy Stein, ‘Great Blue Heron’ oil painting by Paul Brent, miniature abstract by Jo Pomeroy-Crockett, semi-precious gemstone necklaces by Mary Bottita. Tables by D. Fairweather, gallerist and allied member A.S.I.D., American Society of Interior Designers. Photo collage by Linda Fenton-Mendenhall. 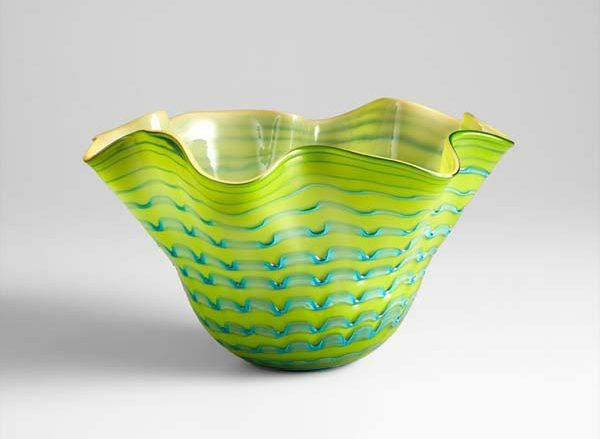 Green art glass: no other medium captures the dance of light and color so perfectly, mouth blown gracefully into a free-form shape. Approximately 20’ diameter at rim. Kemy Kay, art hostess in dressed in the wearing of green, Carol Johansen, frequent gallery visitor. 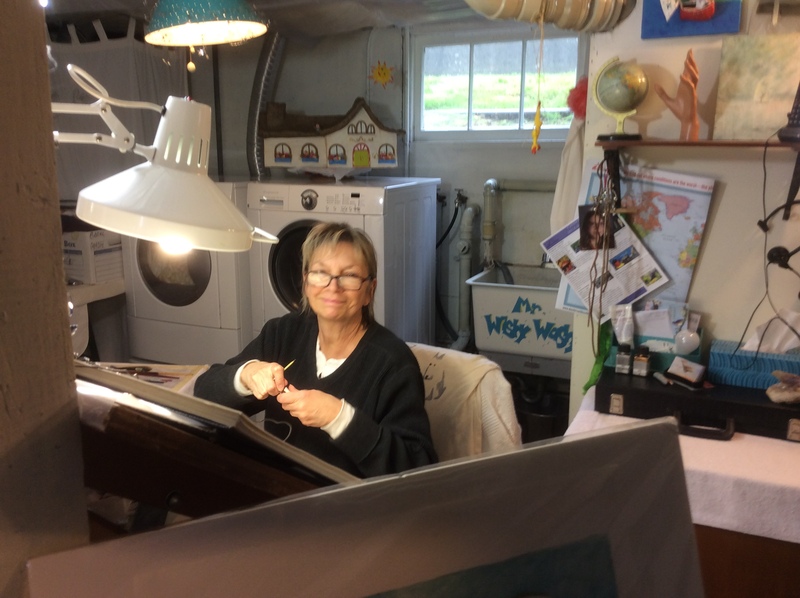 She is a cousin to Fairweather resident artist Linda Fenton-Mendenhall, did you know? 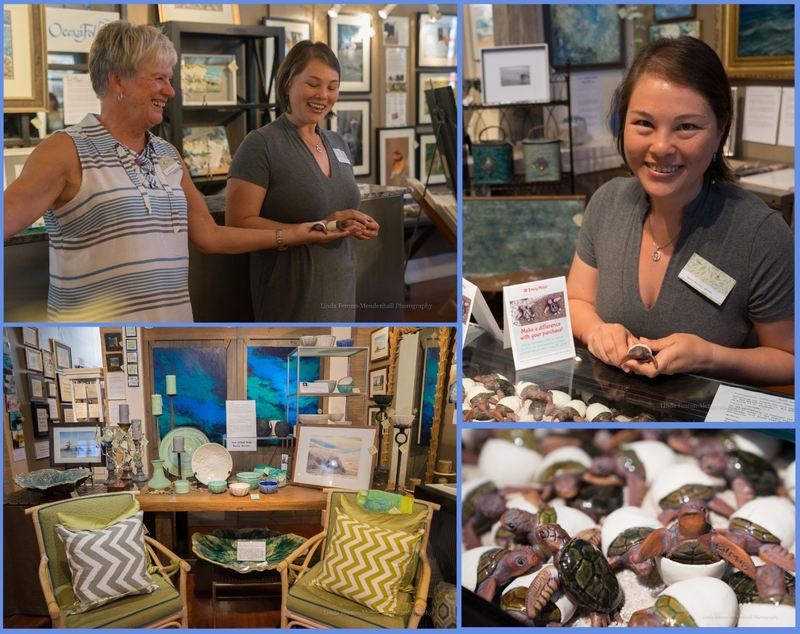 One-of-a-kind hand-crafted art jewelry at the Fairweather Gallery. Distinctive NW artist-made necklaces and earrings. Concert grand piano display for ‘March’ featuring watch necklaces by Brigitte Willse, sea glass jewelry by Barbara Walker, calligraphy by Penelope Culbertson and earrings by Mary Boitta, Mary Hurst, Karen Johnson and Tanya Gardner. Leather key ring cross by Luan and silver cuff by Alan Stockam and Heather Rieder. Mar 12, 2017 – A round of applause for after party images from IRISH LANDS, an exhibition opening at Fairweather’s. Top left: Rain painting by Jeni Lee, mixed media 12 x 12 painting by Jan Rimerman, mini words in wisdom by Diane Copenhaver, ceramics, lava vases and pottery by Emily Miller, mouth blown glass platters by Sandy and Bob Lercari, pastel “Pond Reflection” by Dan Mackerman, as well as calligraphy by Penelope Culbertson. Top center: “Great Blue Heron” oil painting by Paul Brent. Top right: pair of whimsical art by Marga Stanley. Bottom left: Seaside Visitors Bureau/ Tourism booklet 2019 open to a page about the Fairweather Gallery. Nature photography by Neal Maine. 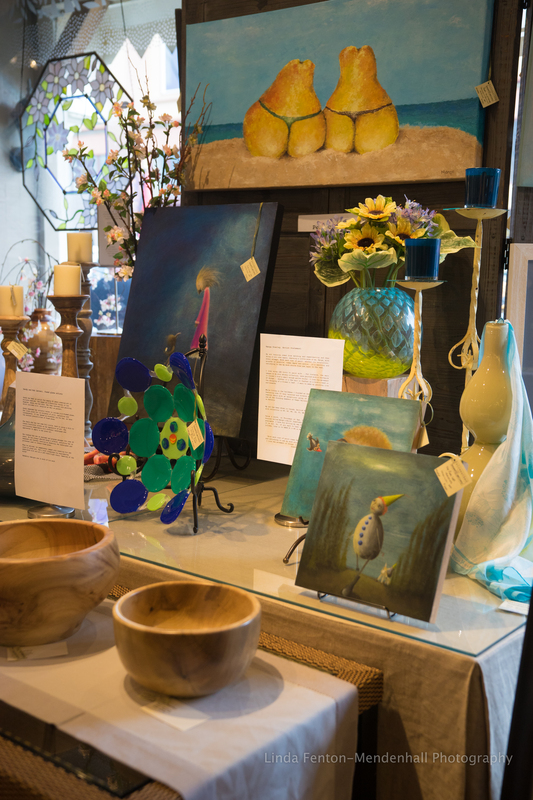 Bottom center: Watercolors on yupo by Carolyn Macpherson and wood boxes by Ray Noregaard. 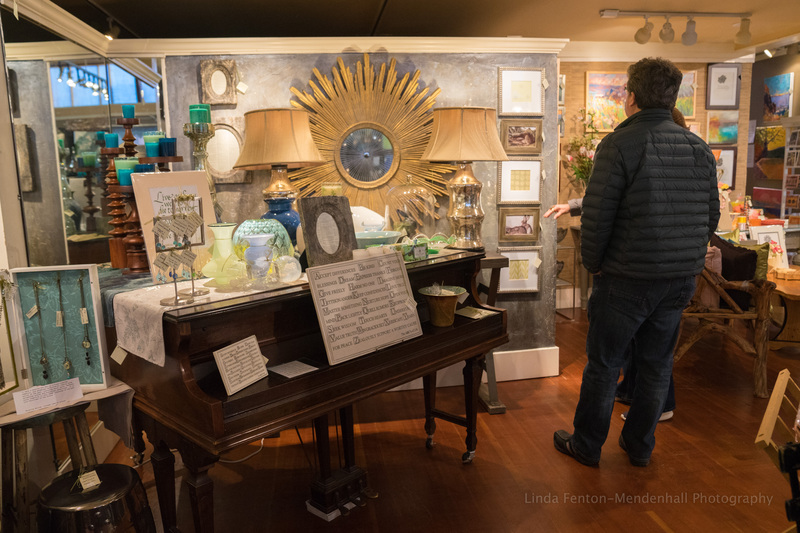 Bottom right: IIumne candle collection on piano, Fine Art lamps, mirror by Currey and Co., indoor/outdoor garden stool by Art Interiors and limited edition rabbit lithographs. 2019 March postcard by Linda Fenton-Mendenhall. 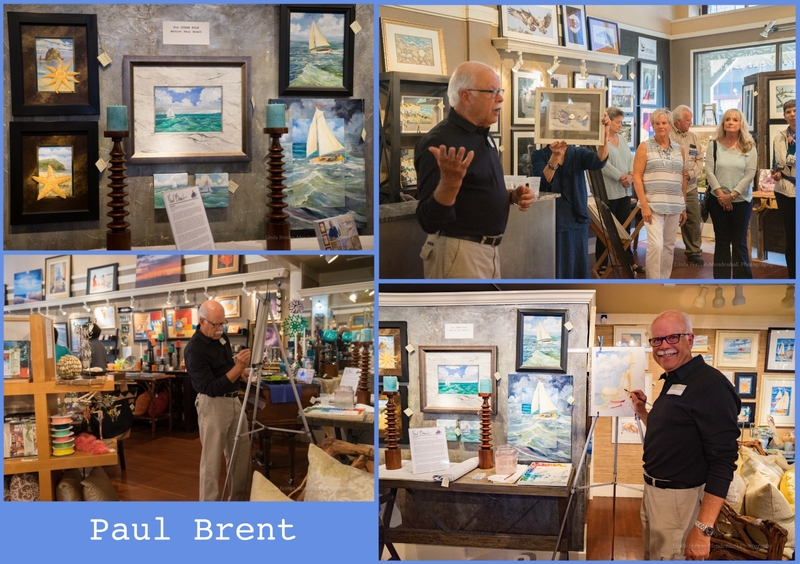 Collage images from OCEAN FOLK artist’s reception. For OCEAN FOLK. Artist Marga Stanley. Smile. Beam. And, repeat, smile wider. Now. 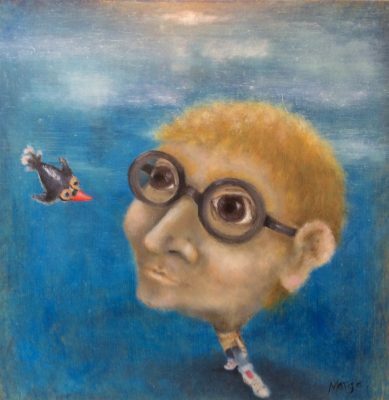 “The Snorkeler” by Marga Stanley. Acrylic on wood panel. Marga Stanley in her home studio, at times, she paints with toothpick. 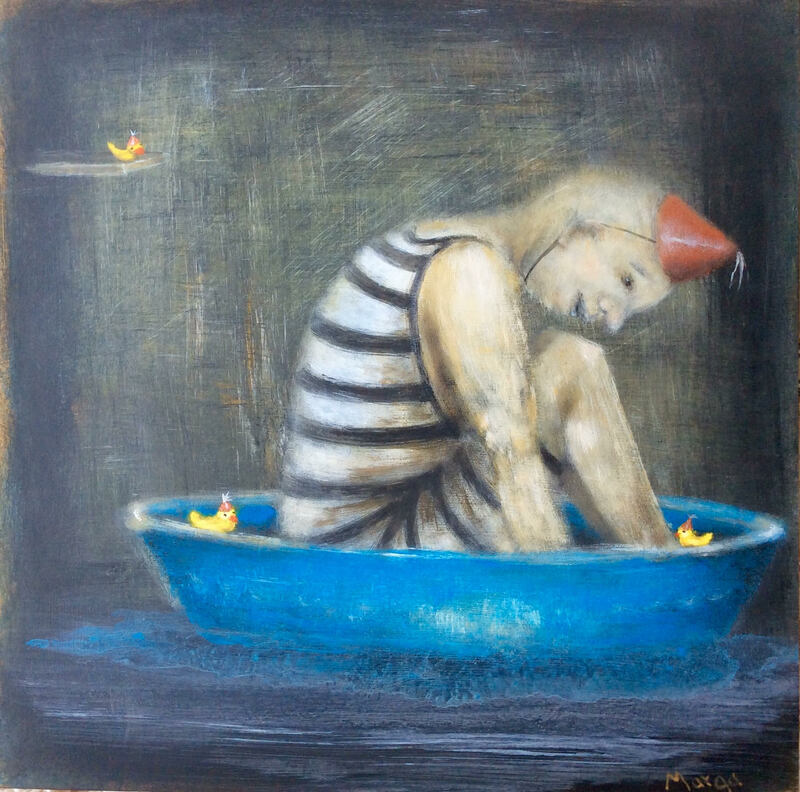 “Pool Party” by Marga Stanley. Acrylic on wood panel. 12 x 12. 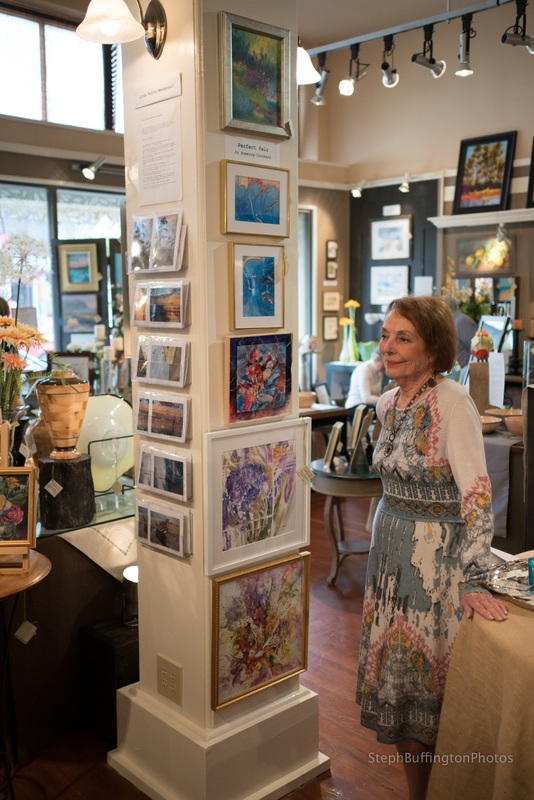 Marga Stanley has lectured at the Fairweather House and Gallery for many years, with many delightful words and beaming many good wishes to art patrons. 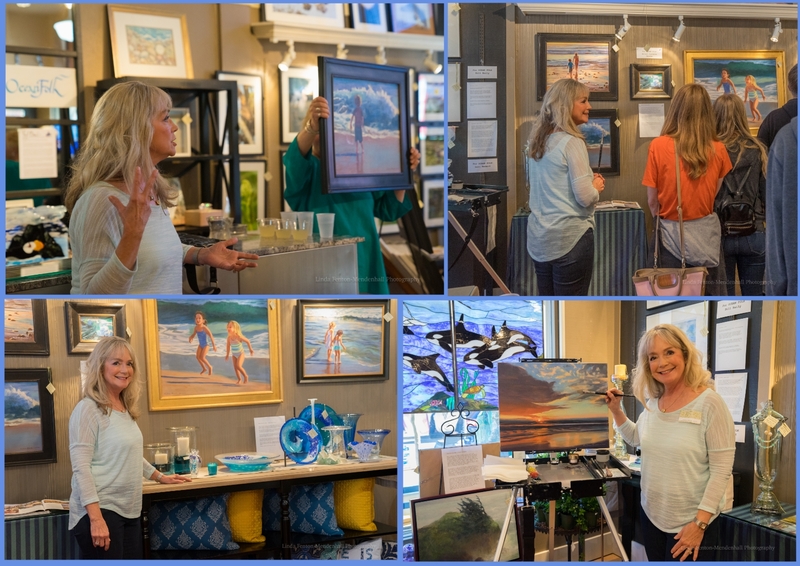 Marga speaks about her “Beach Boys” art journey. 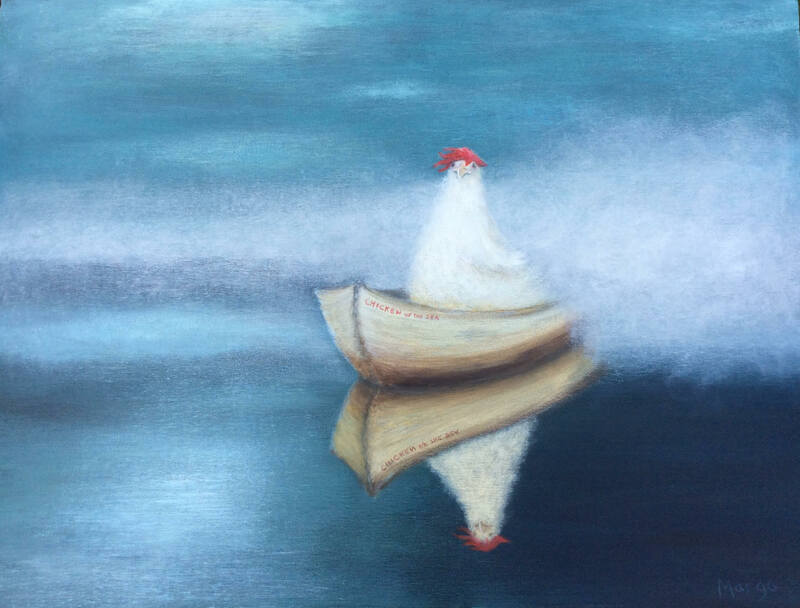 “Foghorn Leghorn in the Chicken of Sea boat” SOLD! Art by Marga. By request, Jo Pomeroy Crockett, PhD, Perfect Pare (aka Perfect Pair and Perfect Pears) lecture. May 2018. “Pare” usually means “to cut back”, to “slice away”, to “remove”, and even “to simplify.” When I thought of the “to simplify”, I was hooked. Little did I know that I nearly shot myself in the foot! 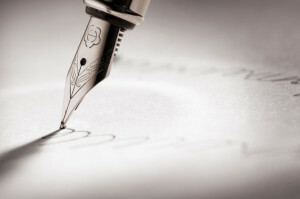 As an artist, “to simplify” means to remove all that is not absolutely necessary to say what I want to say. The challenge is how few lines, how few colors, how few marks on my paper convey my meaning. 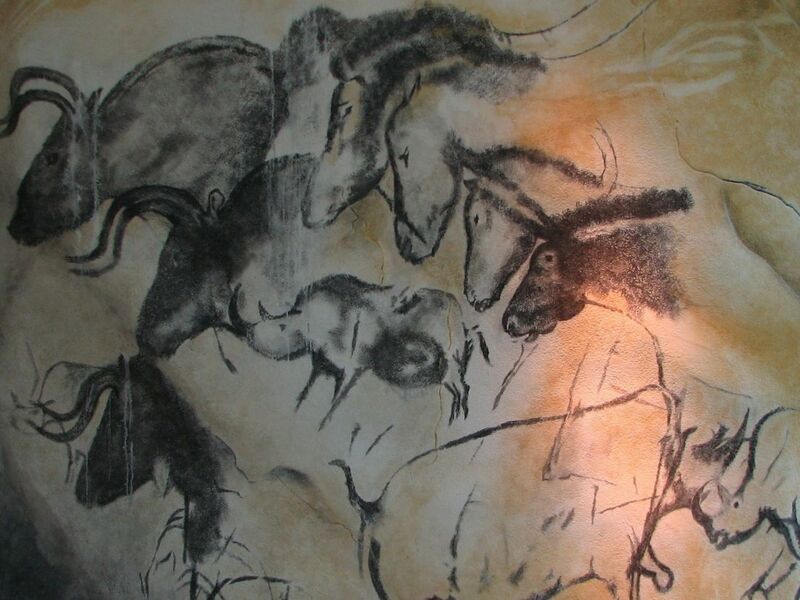 I thought of the cave paintings from 30,000- 40,000 years ago in France and Spain. How simple and how elegant. 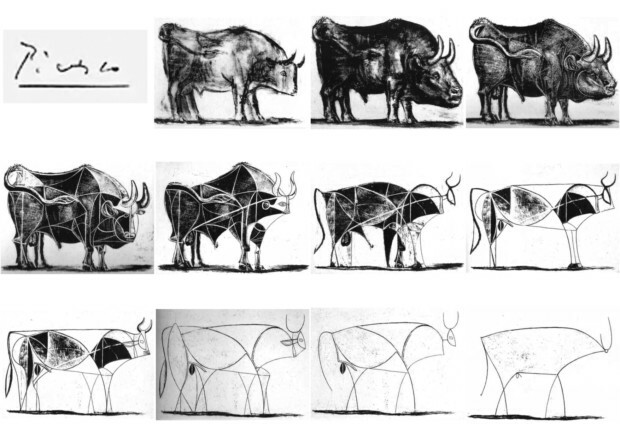 Later, Picasso who was also intrigued by simplifying, drew a series of bulls. The merest line conveyed the strength, the majesty of this noble animal. So, “to pare” is good for one’s art. No more worrying about what is pretty, what will sell, just get to the point! If one line can convey your message, use it. Do not be too wordy or explain too much! Too much thinking about “to pare”; going back to the homonyms? Pear, pair, pare, or au pair? That opens up a world. 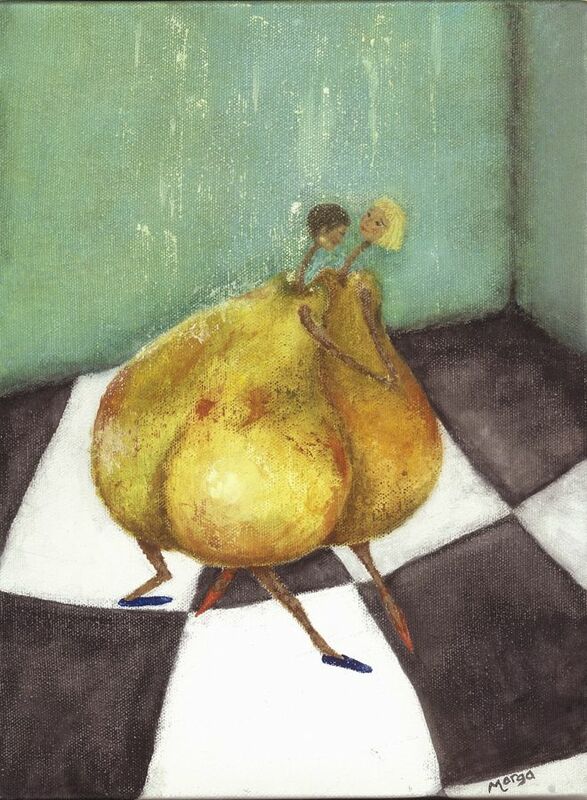 There is a painting here by Marga that is an eye-stopper and it is about “pears”. What a hoot! And the many others which the artists translated “to pare”, “to pair”, or quite simply “pears”. Patti Isaacs paired paintings on silk. I must admit that I gave into to all in my artwork. This was a challenging theme that made me think. I will move toward more line work in my efforts to come to the point, and I shall work “to pare”. Jo Pomeroy-Crockett and her art. And, as I always discover when stretching, thinking is hard work.” —Jo Pomeroy-Crockett, PhD., writer, educator and artist. 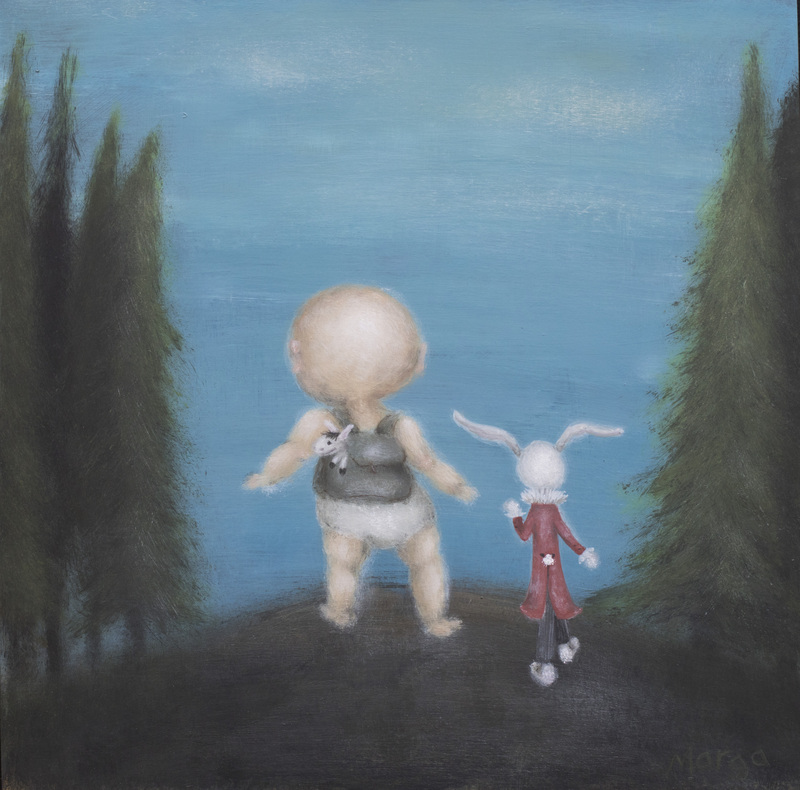 For more info about the artist, please visit http://www.fairweatherhouseandgallery.com/ …artists/ …Jo Pomeroy-Crockett. Regional artists were selected due to their art related to scale and perspective, and the way things correlate and interact. Featuring artists Lisa Wiser, Jo Pomeroy-Crockett, Blue Bond, Marga Stanley, Bill Baily, and Lynda Campbell. Q: Why do artists often study painting pears, you ask? A: Indeed, every artist has spent hours staring at pears, later to paint pears to learn the study of light, shading and perspective. Cézanne once proclaimed, “With a pear I want to astonish Paris,” and he succeeded, even in his most deceptively simple still life paintings, to dazzle and delight. 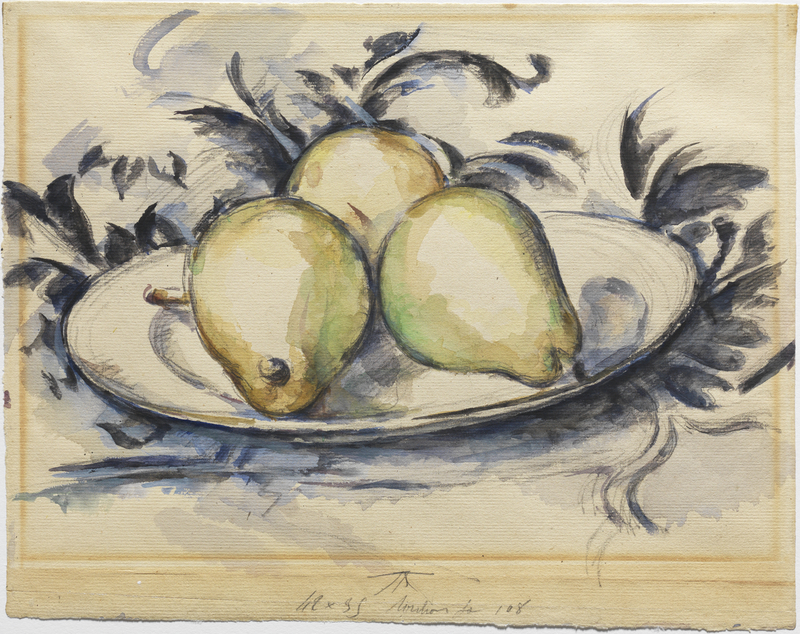 Turning to the pears grown in the vicinity of the family’s estate, Cézanne dispensed with traditional one-point perspective and examined the fruit, plates, and table from various viewpoints—straight on, above, and sideways. 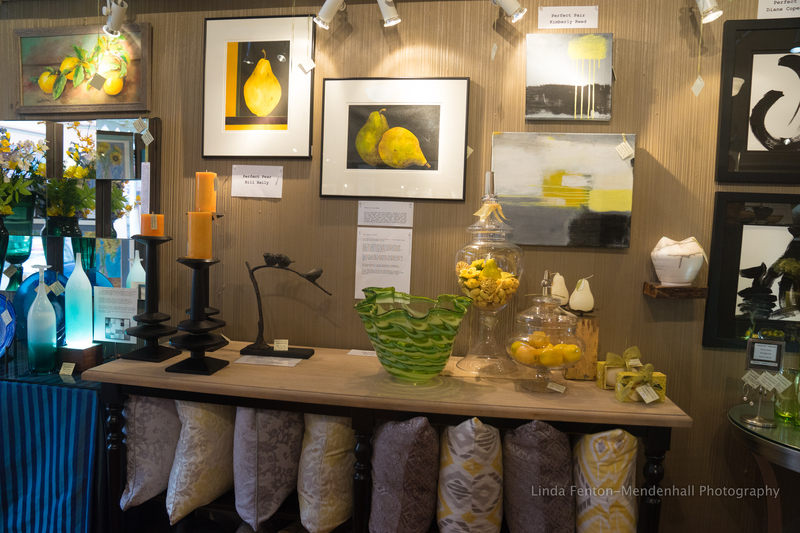 Display featuring pear art by Bill Baily, abstract paintings by Kimberly Reed and abstract art by Diane Copenhaver. The exhibitions(s) “To Pare Perfect”, aka “Perfect Pear”, and, too, aka “Perfect Pair” through May 31 at Fairweather House and Gallery. 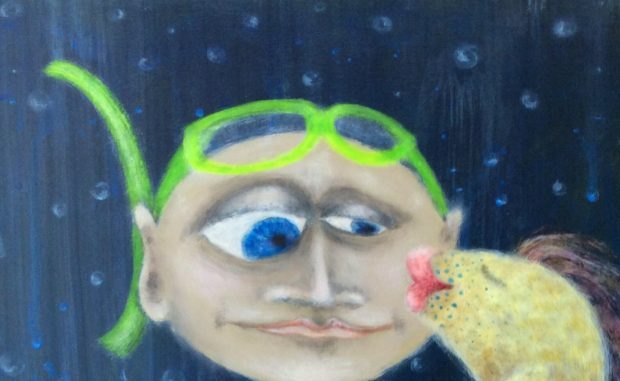 For Perfect Pear (aka Perfect Pair): whimsical artist Marga Stanley. Marga at home in her studio. 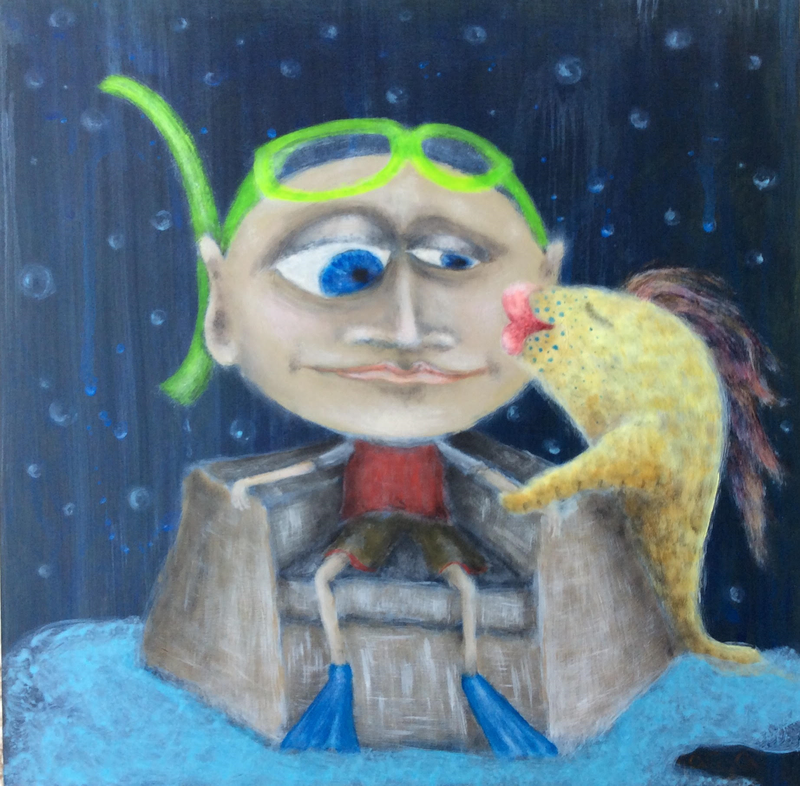 “My art training comes from watching and experimenting and then doing it all over again, exposing a little more of me, Marga, with every attempt. With each coat of paint, whether it’s watercolors, gouache, acrylics and oil comes depth and motion…it’s exciting and satisfying to see my work evolve from one layer to the next. 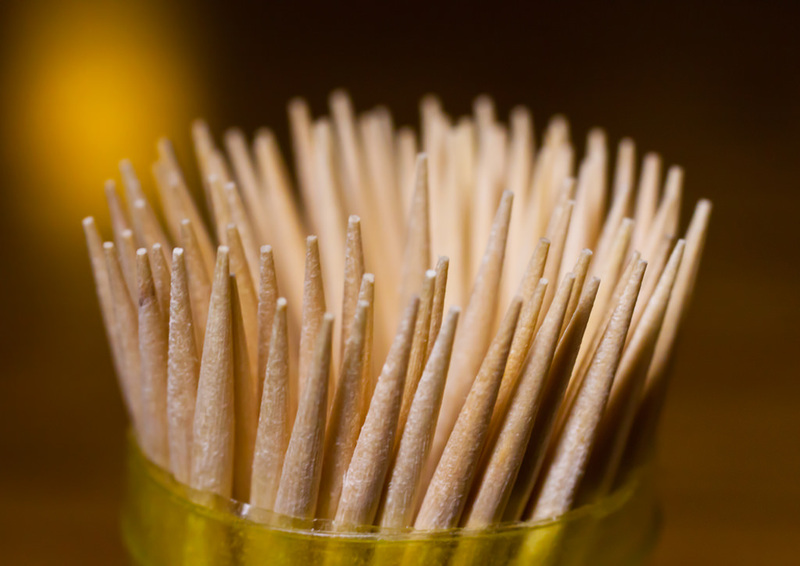 I love using odd tools to paint with….for instance, the main images on my mini whimsy collection, were painted with a toothpick (I couldn’t find a small enough pallet knife). SOLD! Art by Marga at Tempo Gallery. 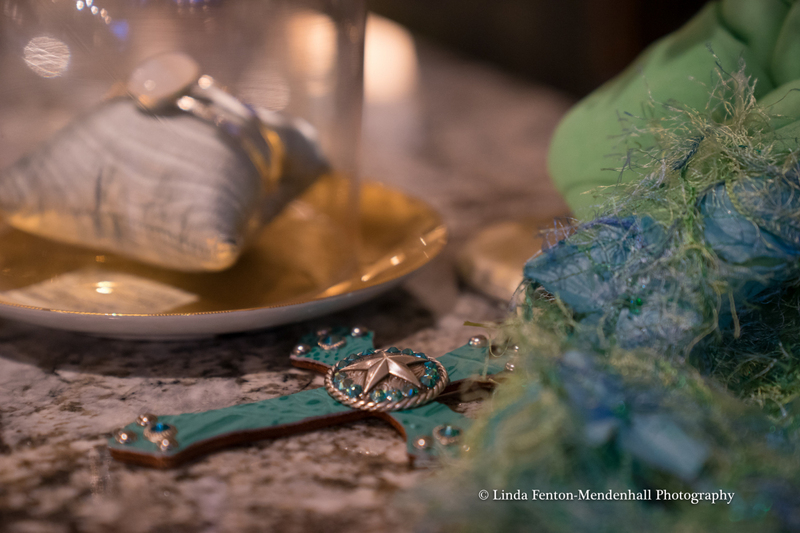 I love the movement of things… whether it’s the hair or feather on a bird’s head or the drooping of a flower’s leaf…I want to make my painting live and breathe. While living in the Caribbean I founded an annual fine arts fair, featuring over 20 very talented and diverse artists. I draw on a regular basis with an exceptional group of local artists and am one of the founding members of Tempo Gallery, an arts collective, in Astoria. My art has been shown in Canada, British West Indies, and the US, with collectors in OR, NY, NJ, MO, CA, FL, WA and Canada and Japan. You are so sweet!!! Thanks for the write up …I am going to share it on. Hope you are enjoying our Spring. Thank you again my friend. Big Hugs!